Growing up, on the rare occasions when I had packaged sweet snacks (my mom nearly always had a full cookie jar of fresh baked goods, so, why go for packaged? ), I was team Little Debbie all the way. I LOVED the Nutty Bars (because, chocolate and peanut butter!). The nut topped Fudge Brownies, warmed up with a scoop of ice cream was a favorite treat. I enjoyed unraveling the Pecan Spinwheels and eating them center-out. I even liked the Oatmeal Cream Pies. It turns out, I still have a fondness for most of the Little Debbie products that I've re-tried more recently as an adult. But my dad was team Drake's. Specifically, Devil Dogs. I never liked them. I still don't. But on a recent visit, I found that he had expanded his repertoire. His snack shelf now included another Drake's product: coffee cakes. These sounded more promising. Oh, to back up, I was assuming you are familiar with Drake's Cakes and Little Debbie. They both make a variety of packaged baked goods, the kind that get slipped into lunch boxes or lunch pails. In our family, they were backups for when the cookie jar ran empty. I think Drake's is more limited to the east coast, and is smaller distribution than Little Debbie and Hostess. 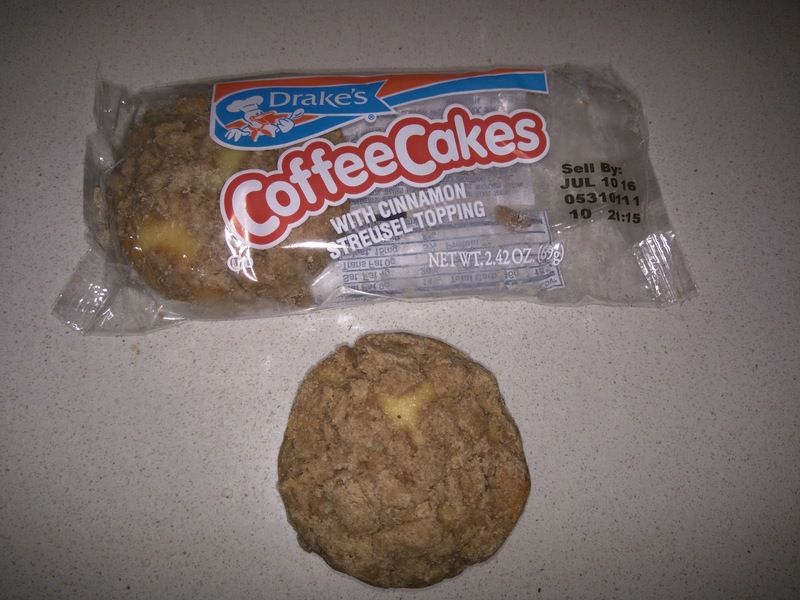 "There's only one Drake's Coffee Cake. Classic round Drake's coffee cake topped with plenty of sweet, cinnamon-flavored streusel." I sometimes really get in the mood for coffee cake. Its a strange craving for sure, as I don't really like cake in general, and particularly not cake without amazing frosting, but, every once in a while I really want coffee cake. Now, to be fair, what I likely want is streusel topping, not cake. So when I saw my dad had a box of these, I uh, helped myself to one. The cakes were fairly thin, hard to tell from this angle. The cake was very very generic white pound cake. It wasn't moist nor dry. It had no flavor. It was just ... there. Totally inoffensive, but also, totally uninteresting. At least it didn't taste like plastic? The streusel was ok. Crumbles of brown sugar. I liked the slight crunch it provided, and I liked the sweetness and flavor. I wanted to just scrape it off and eat it, leaving the boring cake behind, just like when I got coffee cake at Panera. 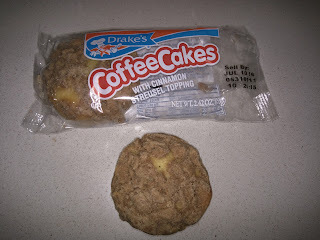 The coffee cakes come two to a pack. If you were having them for breakfast, one is certainly not enough. Or if you really liked them I suppose, one is not enough. But since I wasn't that into them, I only wanted one. I guess I'm glad I tried one, but, I won't find myself stealing one of these again. 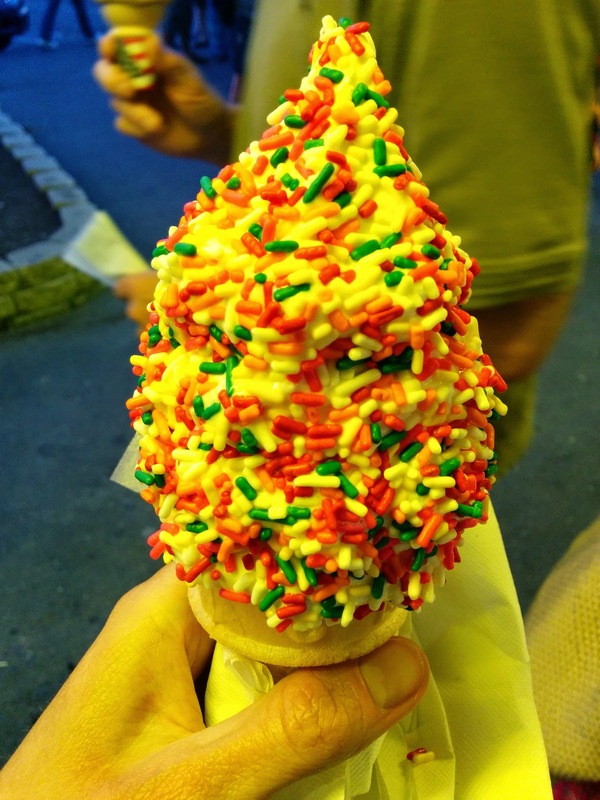 Summertime, in the north east, is about ice cream. Sometimes froyo. When I go visit, I manage to get ice cream basically daily. I'm a bad influence on everyone around me, but, my visits are usually scoped to two weeks or less. And I take full advantage of that time. Last week, you read about my absolute favorite place for soft serve ice cream, Dairy Twirl, in Lebanon, NH. Earlier this week you read about my favorite soft serve froyo and sundaes at the Boston area chain JP Licks. 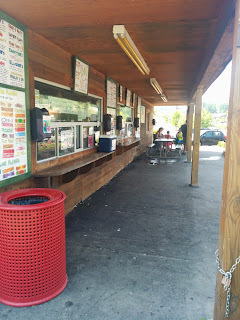 Today brings a review of the other ice cream stand near my home town: Ice Cream Fore-U. 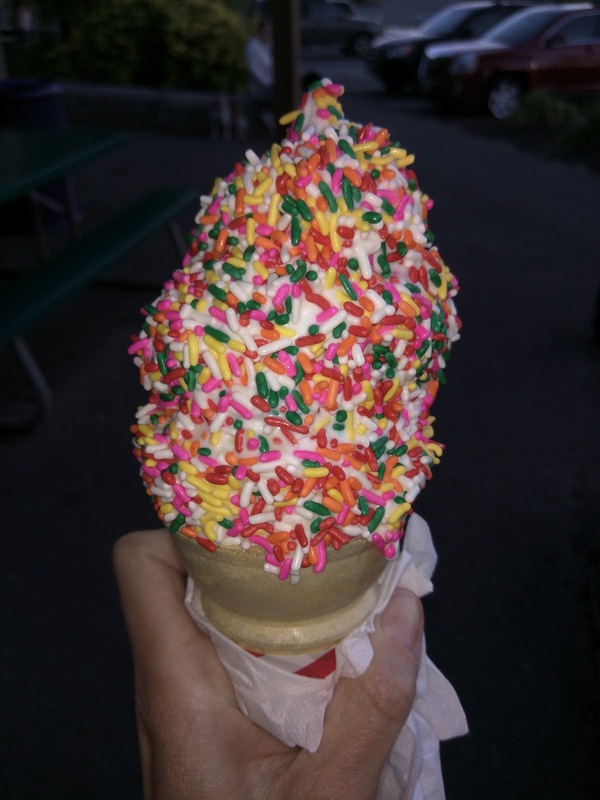 Like Dairy Twirl, Fore-U is open only seasonally, generally Memorial Day through Labor Day. 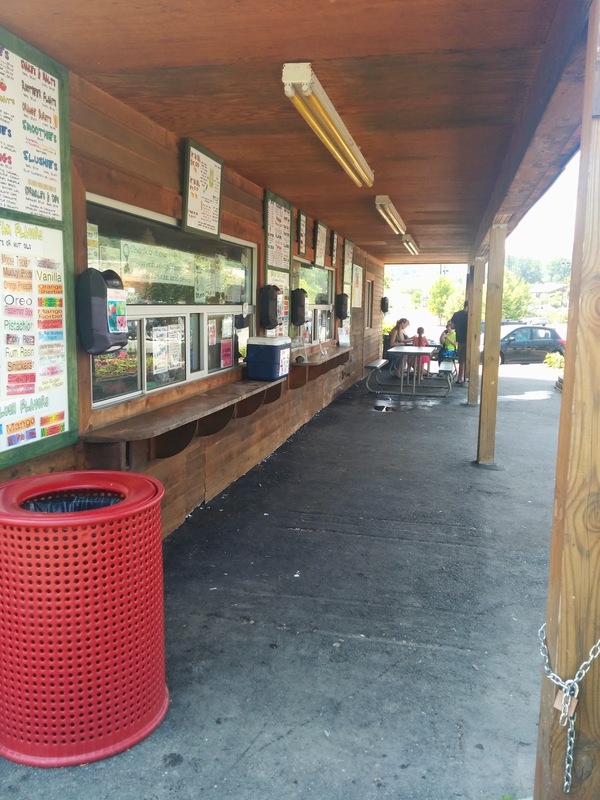 Like Dairy Twirl, it is just an ice cream stand, not a restaurant, although it is located adjacent to a facility with mini-golf course, driving range, and batting cages, hence the name Fore-U. The stand is more attractive than Dairy Twirl, as it is a nice wooden structure with multiple spread out windows to order at. They have plenty of picnic tables under a roofed area and even a bathroom. They also *always* have a line. I have been there at 11am when they open, I've been there at 9pm at night. In the rain. In the heat. In the cold. It doesn't matter. The line is always really, really long. And it isn't because service is slow. The place is just that popular, serving far more people than Dairy Twirl. I suspect this is due to the location on the main strip in West Lebanon. Just like Dairy Twirl, they offer Gifford's hard serve ice cream, and Hood soft serve ice cream. The menu also has shakes, malts, smoothies, and sundaes, plus a few extra items like hot dogs and chips. And coffee. A bigger selection the Dairy Twirl for sure. Fore-U also offers up an additional 40 or so more flavors through an infusion system, where they inject a syrup into the ice cream. So even if a base flavor, or the weekly special, isn't your thing, there are tons of choices here. Like Dairy Twirl, I've tried a ton of flavors of ice cream at Fore-U, and, none of the flavors are ever as intense as Dairy Twirl. You would think that since the base is Hood in both locations, that it would be nearly the same. But ... it just isn't. I believe Hood only makes vanilla and chocolate, so, all flavors are done by the shops themselves with a mix-in. The core flavors are certainly more flavorful than the infusion systems, but, still, Dairy Twirl is overall more flavorful. Hood also makes their base in several different milk fat percentages (5%, 10%), and I'm not sure what either place uses. I'm guessing 10%, as they are both quite creamy. The one area that Fore-U really does win however is the price. When I started taking notes a couple years ago, the size cone I got was $1. $1!!! And speaking of those sizes. Sizes range from baby, to x-small, small, medium, large, then pint or quart. Yes, they have not one, but two sizes smaller than a small. And, um, they are very, very generous sizes. I've accidentally ordered the x-small a few times, forgetting that baby is actually the smallest, and it really is too much for me. A baby size of hard ice cream is two full scoops. An x-small is three. And so on. You can pick any two flavors to have in a cone, layers, or, if they are on the same machine, swirled. They only do a single layer, not multiple like Dairy Twirl. Prices are the same for both hard and soft serve, unlike Dairy Twirl that gives a discount for soft serve. If you choose a flavor infusion, it is more expensive, I think $0.50 more, as they have to individually prepare the flavor for you. Anyway, based on value alone, I pick Fore-U. 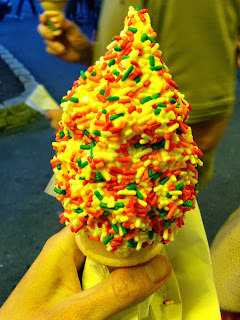 Prices have gone up slightly, but, just several years ago, I could get a cone, larger than I wanted even, for $1. 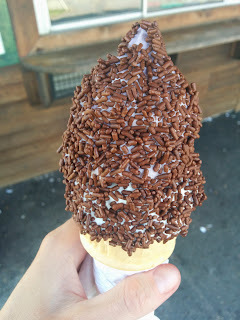 It now is $1.50 (plus 10 cents for my sprinkles/dip), so, still better than Dairy Twirl's $1.75 + $0.50, but, the flavors really are better at Dairy Twirl, so, it is where I generally head. I won't say no to swinging by Fore-U when I'm in the area though! Vanilla with Rainbow Sprinkles, Baby. $1.50 + $0.10. As basic as it gets: vanilla with rainbow sprinkles, always a classic choice, and one I order often when I don't feel inspiration for a particular flavor. 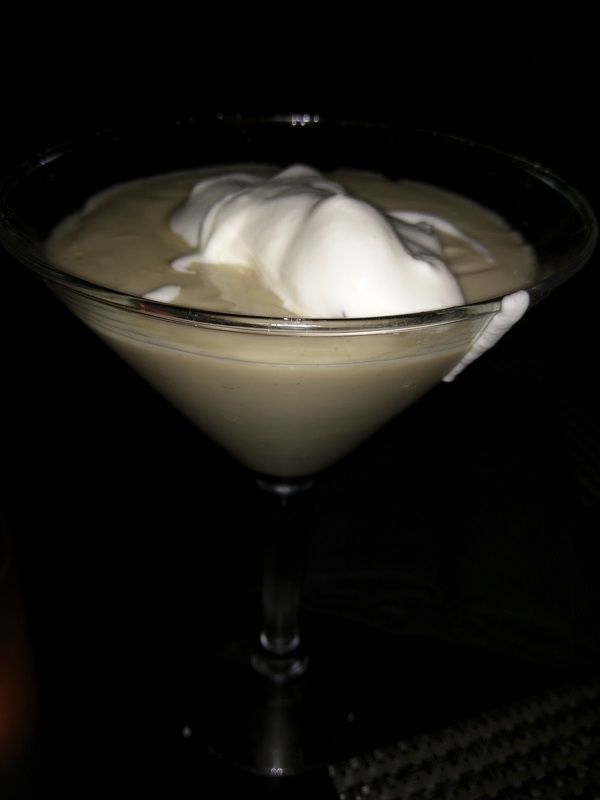 The vanilla at Fore-U tends to be nicely creamy, with a decent vanilla flavor. My numerous tasting notes say things like, "Creamy, nice flavor, pretty good", or "Nice creamy decent flavor", or "Creamy, subtle vanilla" and so on. I regularly note how creamy it is. Sprinkles are available in rainbow or chocolate, and are always well applied. This is always a solid choice at Fore-U, particularly given that I get disappointed by the flavors. Here you can also see the baby cone size. This is a decent size ice cream, nothing really "baby about it. Black Raspberry with Chocolate Sprinkles, Baby, $1.50 + $0.10. Black Raspberry is the only flavor, besides vanilla and chocolate, that is always offered. It is decently creamy, just like the vanilla, but, the black raspberry flavor is very subtle. It doesn't necessarily taste like raspberry, just, some subtle fruitiness. I have ordered this flavor more times than I can count, because I always want to like it, but, alas, it never has enough flavor for me. Dairy Twirl has a much, much better black raspberry. I always pair my black raspberry with chocolate sprinkles. Banana: creamy, banana-y, but uh, meh. As I mentioned, you can get basically any flavor you want, via the Wadden Systems infusions. Fore-U has multiple extra flavor cards, literally, at least 40 more options. These are made by injecting the syrup into a vanilla base. Choices are basically every fruity flavor you could imagine (apricot, banana, blueberry, black cherry, blackberry, lemon, orange, peach, pina colada, raspberry, strawberry, etc), plus boozy options (amaretto, rum), or sweet (caramel, butter pecan, maple nut, cheesecake), and more. I've tried a bunch over the years, but, since you can't taste test these before you order (since they mix them up individually, you have to commit without trying, something I'm always hesitant to do). I'm glad they offer so many options, but, the flavors just aren't nearly as intense as I'd like. Maple Nut (bottom) Peanut Butter (top) with Rainbow Sprinkles, Extra Small. $2.50 + $0.25. On one visit, I didn't like the weekly flavor, and I was sick of regular vanilla, and grumpy at the flavorless black raspberry, so, I opted to go for flavor infusions, not just one, but, two. Hedge my bets. I accidentally ordered an Extra Small, as the person in front of me (my mom) ordered an Extra Small, and I accidentally repeated what she said. Plus, um, doesn't that sound like it should be the smallest one? What I meant to order was a Baby cone of course, the option *smaller* than the extra small. Doh. It might not be obvious in this photo, but, they actually use a bigger cone for the x-small than the baby. The ice cream was fine, fairly creamy, but not remarkable. The peanut butter flavor infusion didn't have much peanut butter flavor to it at all. It was very, very subtle if anything. Honestly, it tasted like vanilla. This matches my notes from all the other times I tried it, where I note that the peanut butter flavor is good, but, too hard to detect in the ice cream, particularly if you add sprinkles. The Maple Nut was a bit better, as I could actually taste something besides vanilla. It had a nice sweetness to it. Overall, this was all just fine. It wasn't icy, it was creamy, but it wasn't anything special. The sprinkles were ... too generously applied. I know that sounds ridiculous, but, I actually ended up scraping some off, because in this quantity, it was just way too many sprinkles. Butter Pecan: very sweet, enjoyable, but I wouldn’t get again. Creme de Menthe: Minty but kinda fake tasting, not very good. Coconut: a bit coconuty but not remarkable. White Chocolate: did not like. Way too sweet, not good flavor. Fore-U is better at pricing than Dairy Twirl for toppings. At Dairy Twirl, all toppings are $0.50, no matter if you get the smallest cone or the largest, and no matter if that topping is sprinkles or if it is peanut butter cups. At Fore-U, sprinkles and dips are only $0.10 for baby cones, $0.25 for everything else, and other toppings are $0.25/$0.50 accordingly. This makes so much more sense, and, I always do get a bit grumpy spending an extra $0.50 to add some cheap sprinkles on my cone at Dairy Twirl (of course, JP Licks wins this one, always offering sprinkles for free). The topping selection is pretty classic and decently extensive, with all sorts of candy and sauce toppings, but, I always go for sprinkles or dip. Sprinkles are available in rainbow or chocolate, dip in cherry, chocolate, or butterscotch. Sprinkles are always applied generously, sometimes almost too generously. I've only ever had the chocolate dip, but, I've never cared for it. It never seemed to harden as much as the dip at Dairy Twirl, not creating the same kind of shell, and, it had no flavor at all. Back in December, I visited the East Coast to see my family and to work from our Cambridge office. On my last night there, I met up with a couple friends from college for dinner. We needed somewhere fairly central, as they were both coming into Boston to meet me from the commuter rail that leads to their respective suburbs. This meant they'd arrive at North Station, and they suggested going out somewhere near there, near Faneuil Hall ... not exactly an area known for its culinary scene. I managed to convince them to walk a little further and go the other direction, towards Boston Common. We selected Scollay Square as our destination, a restaurant I found with good reviews, located just a block off the Common, with a great cocktail program and seafood focused menu (things that matter to me! ), but casual atmosphere, which seemed perfect for our group. We'd all be coming straight from our respective offices, and didn't want to have to get dressed up, and didn't want somewhere too pricey. And, to relive our college days a bit, we obviously wanted cocktails! It was a good choice, and met our needs well. The food was good, although not outstanding, and prices reasonable. Service was good, but the server was very busy, and wasn't able to pay basic attention to us to do things like refill water glasses or bring us a dessert menu. I'd return, but wouldn't go out of my way for it. The restaurant has a bar all the way deep inside, and a small seating section near the front door. It isn't very large overall, and it is a bit hard to get to the bar just to hang out before being seated since you have to walk through the entire space to reach it. The furnishings seem very ... well, very Boston to me, slightly older style, elegant, but not stuffy. Tables are wood, and there are lots of wood accents are around the room. The walls are covered in large, artsy photographs. 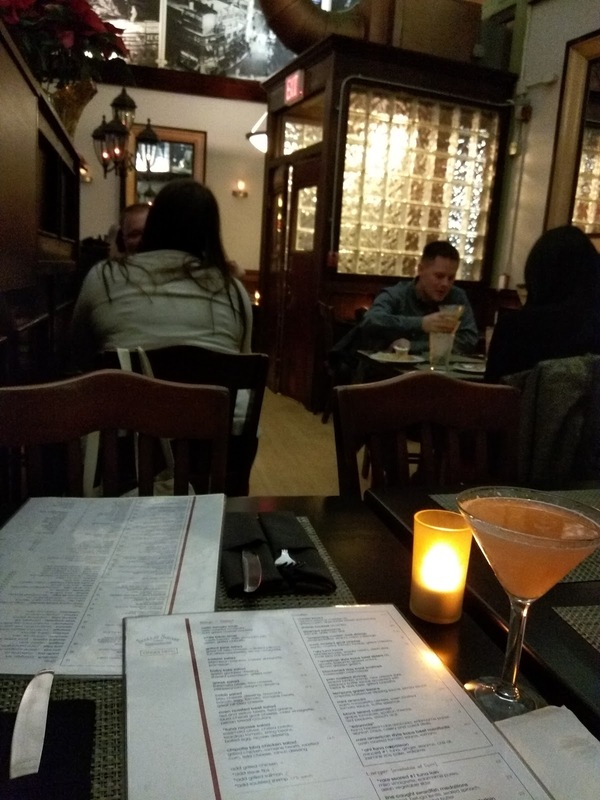 The lighting adds to the ambiance, with lamps on the walls that look like old fashioned street lamps, and candles on the tables. Tables are set with placemats and black cloth napkins wrapping the silverware. One friend went for a simple dirty martini, and she was happy with her selection, although she moved on to a glass of brut next. The other went for a daily special with a sweet fruit jam inside of it. She didn't stop at just one, so, I think it was a success. I opted for the grapefruit basil martini. I do like gin, and it sounded quite refreshing. It wasn't really. The grapefruit was incredibly bitter, and I don't think they really added any sugar to balance it. 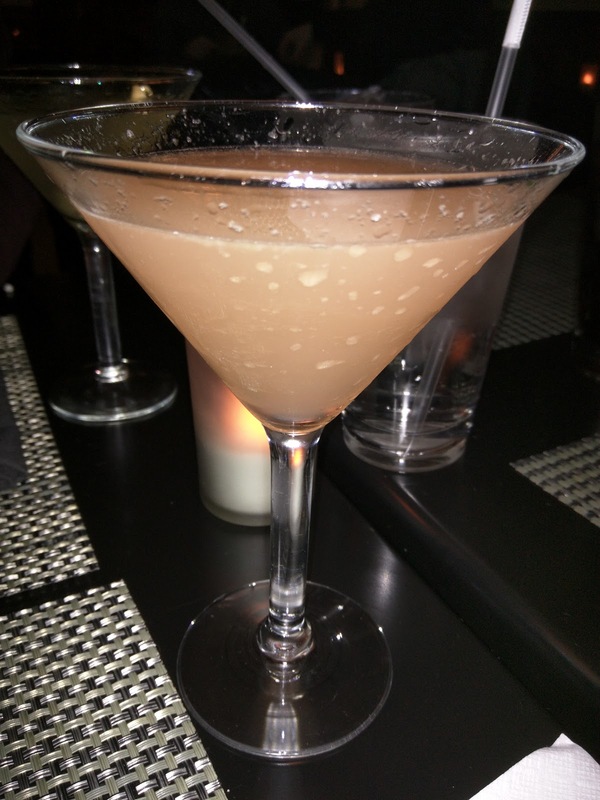 I didn't want a sweet drink, but, the grapefruit and the gin together without anything to balance was just too harsh. I also didn't taste any basil. Really, I wanted this to be like the delicious "Rising Sun" I had a Legal Crossing a few days prior, a gin and yuzu based drink, that was actually balanced and refreshing. I diluted it a bit, and liked it more, but, it just wasn't refreshing as I wanted, and it wasn't balanced enough. $12 is more than I want to pay for a basic cocktail, but seems in line with Boston pricing. In addition to a very extensive soup and salad menu (including entree sized salads), and grilled flatbreads, there is a huge assortment of "smaller" plates available to start your meal. Largely seafood focused, with several shrimp options (poached or fried), several ahi options (tacos, a napoleon), scallops, calamari, and more. For meat lovers, kobe beef shows up as sliders or meatballs, and vegetarians have a lot to choose from as well, including some very tempting looking tempura fried green beans with a dipping sauce. 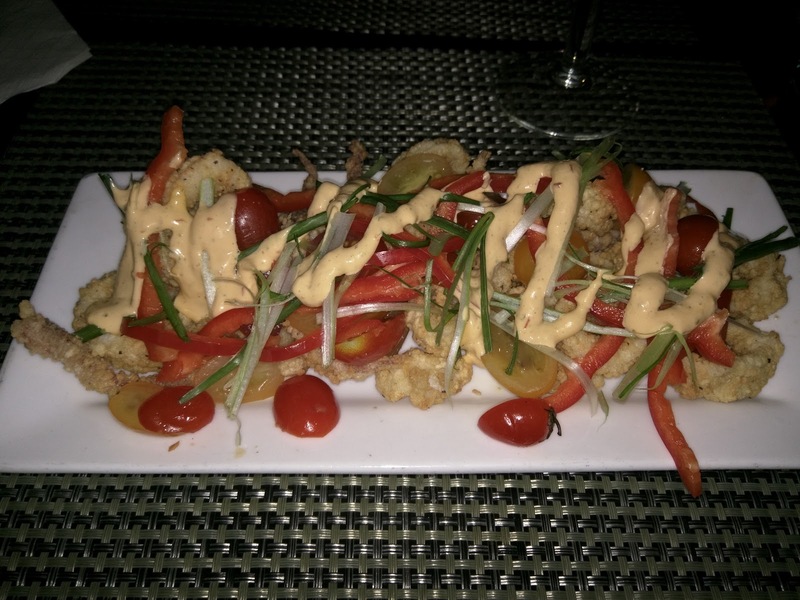 Block Island Calamari / Grape Tomatoes / Scallion Threads / Red Peppers / Sriracha Aioli. $11.50. I really wanted fried seafood. I had two options, fried calamari or "screaming rooster" rock shrimp. I almost went for the rock shrimp, but the waitress told me she preferred the calamari. The calamari was actually really nicely prepared. The batter was flavorful, it was crispy, and not at all oily. Really nicely seasoned, salty in a good way. Most of the portion was rings, just one full body with tentacles in the middle of the plate. It wasn't rubbery, or fishy. Just really nice. What I didn't like was the vegetables served with it. The grape tomatoes were out of season (it was December), served raw, and just kinda mushy and flavorless. The red pepper was extensive, there was tons of it, and it was just raw. So many raw peppers, they overwhelmed everything. Why not fry these too? Or have little sweet peppers? Anything, but boring, raw, plain red peppers, taking over the dish. Also taking over the dish was the scallion threads, again, tons of them. I liked that they were trying to add freshness, but, this just didn't work. I did like the sriracha aioli, spicy, creamy, but drizzled over the top. I wanted to be able to dunk into it, and, I wanted more. One complaint I have is with the plating itself. There was so much piled onto this awkward plate that it was impossible to get a piece without pushing something off the far side of the platter. No matter how careful I was, I kept having things sliding off the far side. I wish I'd gone for the rock shrimp, as it came with napa cabbage, which sounds much better than the veggies that came with this. Still, the tempera batter and frying job was great. I'd love to try the rock shrimp, or the fish and chips, next time. This was good, but had enough issues that I certainly wouldn't rave about it. The menu for mains is incredibly extensive, like every other section of the menu. Numerous seafood options, like rare tuna, bronzed swordfish, roasted haddock, glazed salmon, and several lobster dishes. For the non-seafood eaters, there is chicken, pork tenderloin, beef short ribs, steak frites, and a single vegetarian pasta. The full bar food menu is also available in the dining room, so if you want a burger (hamburger, lamb burger, or tuna burger), or comfort food like steak tips, mac and cheese, stir fry, or fish and chips, those are also all options. One diner opted for the steak tips from the pub menu, and really enjoyed it, particularly with the "potato lasagna" on the side, a delicious layered, cheesy creation that was like au gratin potatoes meets lasagna, sans pasta. Pan Seared Day Boat Scallops / Bacon studded rainbow chard / Mashed / Beurre Blanc / Chive Oil. $22. Mmm, scallops. Besides local, fresh Dungeness crab, scallops are certainly my favorite seafood. I love them seared, medium-rare. The menu at Scollay Square drew me in for many reasons, but one is that they have not one, not two, but three different scallop preparations. One is on the pub menu, the most casual option, broiled scallops with crumbs and garlic butter, served with fries and slaw. Another is on the small plates menu, blackened day boat scallops with horseradish marmalade, a smaller portion, for only $11.50. The final is a full entree, and what we opted for. The mashed potato was kinda lumpy and not great, really just generic mash. The bacon studded rainbow chard was amazing though, fresh greens, and delicious bits of salty, crispy bacon. The bacon also complimented the scallops well. The scallops were nicely cooked. They didn't have the hard sear I prefer, and weren't mid-rare, but they were fully medium, and not rubbery, not fishy. So, for the style of scallops, nicely done, well seasoned, and enjoyable. 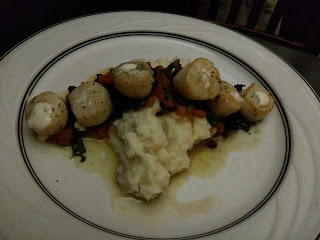 I wished for a little more of the beurre blanc, which seemed to just be a dot on each of the 6 scallops. The $22 price was good for a entree, and this was a nicely sized meal. I'd definitely get the scallops, or delicious bacon chard, again. Our server was good, but, very busy. We sat a very long time after our plates had been cleared, with no offer of dessert. She rushed by several times, never looking our way. Finally, I flagged her down, because I really can't skip dessert, and, I knew from looking online how amazing their dessert menu was. They had wwo selections for the chocolate lovers (flourless chocolate cake or a chocolate dacquioise duo, both gluten free too), plus a fun sounding "s'mored sticks" with toasted marshmallows, melted chocolate, peanut butter sauce, and graham cracker crumbs. But I had my eyes on one thing: the puddings. Of course, I wanted coffee to go with my dessert. It wasn't listed on the menu, but I asked for it anyway. 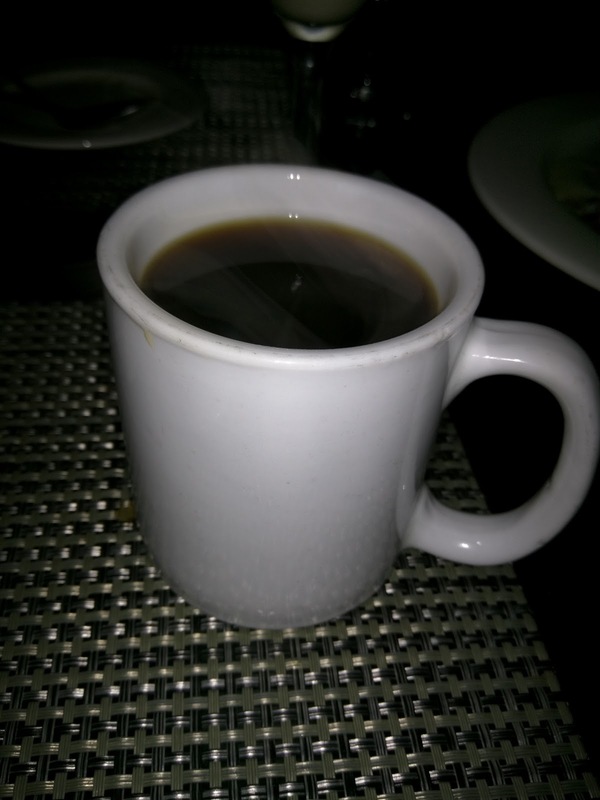 Sadly, it arrived long after my dessert, because the waitress had to brew a fresh pot. It was ... fine. Not particularly good, not particularly bad. Obviously hot and fresh. I'm not sure the price, as the waitress realized after we'd paid that she forgot to put it on the bill. I just tipped her a bit extra, even though we weren't given particularly good service due to her busyness. Butterscotch Pudding / Handcrafted Caramelized Sugar / Local Butter / Cream / Fresh Vanilla Bean / Whipped Cream. $8. So, pudding. I adore pudding. Such a comfort food for me. I like pretty much all forms of pudding, ranging from set custards like crème brûlée, to jiggly panna cotta, to rice or bread puddings too. So to say I was excited when I saw pudding on the menu is an understatement. And butterscotch pudding is a favorite of mine, something my grandmother always made. This was a very good pudding. It was kinda loose and runny, so the consistency wasn't amazing, but the flavor was. It wasn't a classic butterscotch flavor, more like a maple flavor, but it was delicious. The whipped cream on top was kinda sad, not fluffy, totally fallen. But, I appreciated the whipped cream. So, was this amazing? Well, no. The pudding could have been set better, the whipped cream was laughable, and I wished for some crunch on top, but I really did enjoy this, and the $8 price was quite reasonable. 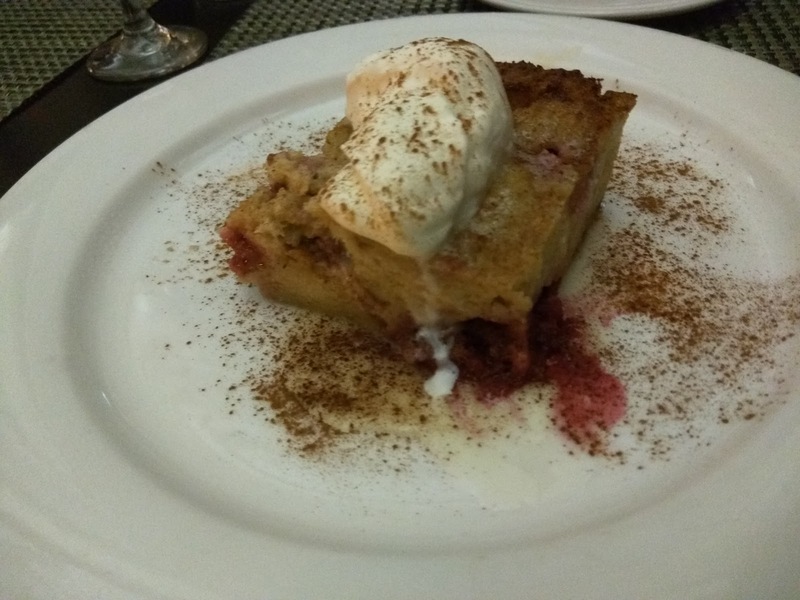 Bread Pudding / Raspberry & White Chocolate Custard / Vanilla Sauce / Whipped Cream. $8. The other dessert I had my eye on was the other "pudding", the bread pudding. It wasn't as successful as the butterscotch. It was served piping hot, so points for that. But the top wasn't crispy, the interior just kinda soggy, no real flavor to it. There was mushy, seedy, raspberries mixed in, which I didn't like, due to the seeds. It was covered in cinnamon, and the cinnamon and raspberry didn't go together very well for me. On top was more whipped cream, again, deflated. Overall, this disappointed in every dimension. I also never found "white chocolate custard" nor "vanilla sauce". After a few bites of this, I just went back to the butterscotch. This went unfinished. Again, $8 price was good though.